Dazzling whitewashed churches, flawless blue sky and the even deeper blue of the twinkling Mediterranean sea: no wonder Greece and its islands are the world’s favourite playground. But surely the best way to visit an island nation is by ship? Almost every cruise line sails here, and because it’s just a short flight from the UK you can come for any duration – short or long. What’s more, with a welcoming climate all year round, there is no bad time to explore these 3,000 diverse islands and their ports. And what treasures you’ll discover – the great archaeological sites of antiquity, unique churches and monasteries, world-class museums, delicious, out-of-the-way restaurants and tavernas, and who knows, maybe even your own perfect beach. So where to start? Greece is proud of Piraeus, the largest passenger port in Europe. With 11 berths, this huge harbour can accommodate even the latest megaships with ease. But then they know a thing or two about shipping here. Just seven miles from the heart of Athens, Piraeus can trace its origins back to the 5th century BC, when it was the most important trading centre of the entire known world. Today it is the hub of the Greek cruising experience, with easy access to the great attractions of the capital (hop on the Metro, a short walk from the cruise terminal, and you’ll be at the Acropolis in just 30 minutes). There are more sights in Athens than you could see in a week – or a month – but if you don’t have that long to spare, make sure you visit the new Acropolis Museum, a stunning piece of architecture in itself, and the Panathenaic Stadium, which is almost 2,000 years old and built entirely of marble. If you can, visit the picturesque neighbourhoods of Plaka and Monastiraki. No time even for these? It hardly matters, because almost everywhere you turn in Athens you’ll find galleries and museums, charming cafes, enticing restaurants and designer shops. The largest of the islands, Crete is one of the most popular holiday destinations in all of Greece. Its capital, Heraklion, is a seaside city whose harbour is guarded by the massive 16th century Koules fortress – but this is a modern metropolis, brimming with culture and entertainment, fabulous restaurants and luxurious places to stay. Take a stroll from the harbour to the city centre, with its lovely walkways lined with Venetian-style buildings and shops. If you love history you’ll head straight for the Archaeological Museum, where you’ll discover the world’s best collection of relics from the great Minoan civilisation that flourished here in the second millennium BC. Then take an excursion or hop on a bus (about 15 minutes) to the Palace of Knossos, an ancient complex that is often called Europe’s oldest city. Alternatively, there is the delightful restored village of Archanes nearby, a beautiful reconstruction of life in Greece before the modern age. This is also a wine-growing district – and you can taste local vintages at the Sinadinakis Winery. Built by the Crusader knights, Rhodes Old Town is a UNESCO World Heritage site, celebrated as one of the best preserved medieval settlements in the world. Behind its imposing fortified walls you’ll discover a maze of fine buildings and narrow lanes. Stroll down the Street of the Knights, visit the Palace of the Grand Master – a storybook medieval castle – and linger in the cafes and restaurants of lively Hippocrates Square. Then take a ride to the Mandraki district, which is outside the ancient walls but no less impressive, thanks to buildings such as the Venetian-style Government House and – something of a contrast – the National Theatre, a masterpiece of 1930s modernism. 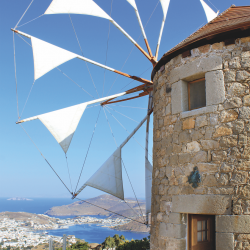 The tiny island of Patmos is a great destination for nature lovers, thanks to its wild coastline and fertile volcanic soil. But this is a deeply spiritual place, too – here you can see the Cave of the Apocalypse, where St John the Divine received the visions that he recorded in the Book of Revelation. You can also visit the Monastery of St John the Theologian, where a 900-year monastic tradition continues unbroken on its lofty hilltop. Then you can enjoy more earthly delights in Hora, the island’s capital, with its elegant shops, cafes and restaurants. As your ship enters the great caldera of Santorini – all that remains of a once mighty volcano – you’ll take in one of the most impressive sights on earth: towering rocks, villages so high they seem to brush the clouds, and whitewashed churches teetering on the cliff edge. 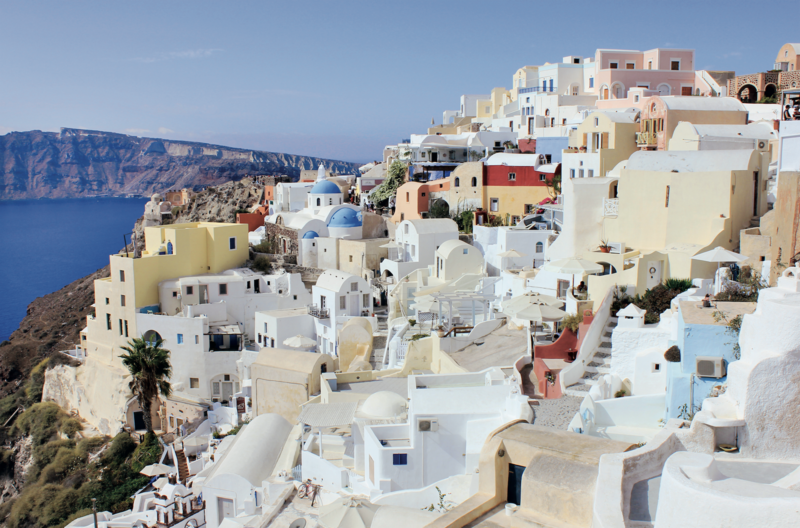 You’ll disembark at the foot of the cliffs below Fira, the island’s capital and home to its major institutions, including the Archaeological Museum. Take a walk down the famous Gold Street, named for its many jewellery shops, stroll through the galleries, visit clothing stores and charming cafes. And as evening approaches, don’t forget to visit beautiful Oia, the most cosmopolitan village in Santorini, which is world-famous for its amazing sunset views. 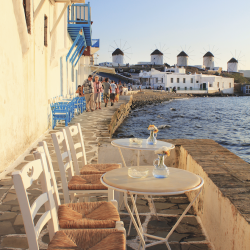 Glamorous Mykonos is an island for those who like to party – and those who love to shop. Stroll its lovely cobbled streets, meet the much-photographed town pelican (something of a celebrity in his own right) and spoil yourself with designer clothing and jewellery on sophisticated Matoyianni Street. Then give your tastebuds a treat at some of the world’s most exclusive restaurants. If you feel in need of a little spiritual nourishment too, you’ll find it at the monastery of Panagia Tourliani in Ano Mera, with its beautiful marble campanile and striking red dome. On the Peloponnese peninsula, the small port of Katakolo is a must-stop on any cruise itinerary because it offers easy access to Olympia, one of the truly great sites (and sights) of the ancient world. The archaeological museum here is one of the largest in Greece – which is saying something – with world-class collections from every period of classical antiquity. And you’ll want to make sure your Instagram feed is up and running, because this is the home of the original Olympic Stadium – the birthplace of the Olympic Games, first held in honour of the god Zeus in 776 BC.